The price: Professional plans start at $26/month; 14-day free trial. Animoto allows you to simply choose a pre-built storyboard and start adding photos and video clips. You can use the collage and split-screen tools to show several photos at once, or photos and videos alongside one another. Add your voice-over, or choose from a library of 2,000 songs. Then, add some text and share or embed the video directly from the Animoto interface. Best feature: Option for square videos using pre-built storyboards optimized for mobile. The price: There’s a free plan, but businesses will want to upgrade to the premium plan for $99 per year to get rid of the Biteable watermark and access additional social media video tools. Biteable bills itself as “the world’s simplest video maker.” With a library of pre-built scenes, including animations and real video footage, it does make creating a video as easy as dropping elements into your storyboard and adding some text. You can upload your own footage if you like, but Biteable really shines for those who are looking for someone else to do most of the heavy lifting. Best feature: The ability to create complete videos, including real video footage, without ever picking up a camera. The price: Plans start at $39/month ($299/year), but business will want to upgrade to the GoPremium plan for $79/month ($599/year) to remove the GoAnimate watermark and access additional social video tools; 14-day free trial. GoAnimate is different from Biteable in that it allows you to create your own scenes in which customized animated characters interact with and speak to one another. When you record your own dialogue, the characters’ mouths will automatically sync up to match the recording. You can add your own logo, images, and audio files to match your video to your brand, and export the video straight to YouTube and other video hosting sites, or download so you can share to social. You can also use the suite of video tools to create whiteboard animations, or video infographics. Best feature: Ability to create custom characters using the character creator, so you can make a digital version of yourself, your target customers, or any of the key people in your company. The price: Comes bundled with a new Mac; iOS app $4.99; macOS app $14.99. 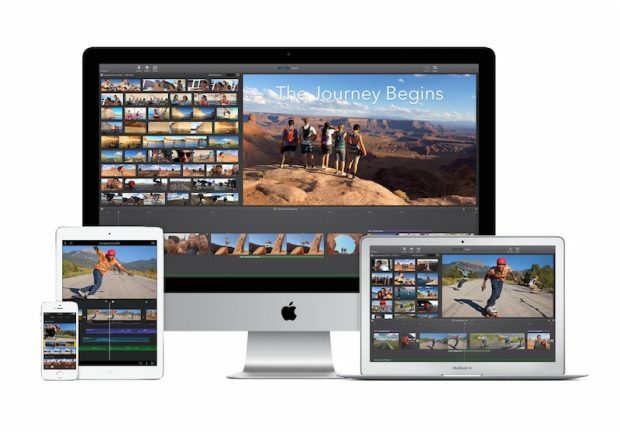 iMovie is the classic video editing app for the Apple generation. It’s a robust video editing program with advanced options like picture-in-picture, split screen, and ability to use green screen filming to add in custom backgrounds. There’s a library of included music, title sequences, and sound effects, along with a suite of 10 filters to customize the look of your video. You can post directly to YouTube, Vimeo, and Facebook, or export a file to upload to other social channels. Best feature: You can seamlessly start your your video project on your iOS device and finish editing it on your Mac. Unlike the other social media video apps on this list, Legend does not allow you to combine photos or video clips. Instead, Legend is all about animating your words. The animated videos, which can feature just one background photo or video clip, are a maximum of six seconds long. You can save your animation as a GIF or a video, then post directly to Instagram or download to post on other social networks. Best feature: It takes as little as two taps (plus entering your text) to create your video. The price: Plans start at $2.49/month, but marketers will likely want to upgrade to the business plan ($9.99/month) or marketers plan ($49.99/month) for expanded social media video tools and the ability to add branding; seven-day free trial. Magisto uses artificial intelligence to create videos with virtually no editing work on your part. You upload photos and video clips, and video tools like facial recognition and speech recognition work with the “AI-based storytelling engine” to stitch things together. You can make manual tweaks if you’re not happy with the automatic edit. Best feature: Fully automated video editing allows you to create videos in record time. The price: Ripl offers a free option, but marketers will likely want to upgrade to Ripl Pro ($9.99/month) to replace the Ripl logo with their own branding and access other premium social video tools. This video app combines up to eight photos with your text to create a short animated video that you can post directly to Facebook, Instagram, or Twitter, or download to post elsewhere (Pro plan only). Best feature: Create quick, catchy videos from still photos, with no editing skills needed. This free tool has solid functionality. To start, choose a pre-built theme and customize your layout, colors, and fonts. Add icons, photos, and video clips—your own or a selection from the extensive library of photos and icons—then complete your video with animated text overlay. You can add your own narration, choose from the provided audio clips, or import your own music, then share directly to your social networks. Best feature: The video templates guide you through creating a compelling video, with hints about how to set up an effective narrative structure based on your video’s goal. Available for: Browser or iOS. If you’re keen to put these social video apps and tools to use but don’t know where to start, check out our quick tips for creating compelling social videos and our post on how to optimize video for different social media channels. Note: All prices listed are U.S. dollars.